Though this Upper West Side apartment doesn’t look like much, it’s certainly racking up the celebrity accolades. 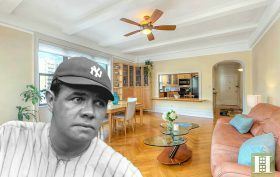 At the end of his career, from 1929 to 1940, Babe Ruth and his family owned the entire seventh floor at 345 West 88th Street. At the time it boasted 11 rooms, but it’s since been divided into two units. One unit, 7B, hit the market for $1,595,000 last August; the other, 7F, listed in February for $1,175,000. According to the Observer, the latter has sold for $1,130,000 to former “How I Met Your Mother” actress Ashley Williams and her husband, producer Neal Dodson.